I picked up this week's Weekly Famitsu (dated 31st December 2015) for the promised details about the new Sengoku Basara: Sanada Yukimura Den (Sengoku Basara: Sanada Yukimura Legend) PS3/PS4 game due for release this summer. Here's a summary in English; please forgive any errors as I'm so excited typing this up that I'd make Yukimura look calm. The article about the new game leads with a cool picture of Yukimura dressed in a more elaborate outfit with golden highlights and a longer jacket - it looks much more like a traditional jinbaori and a little like his special costume in The Last Party. 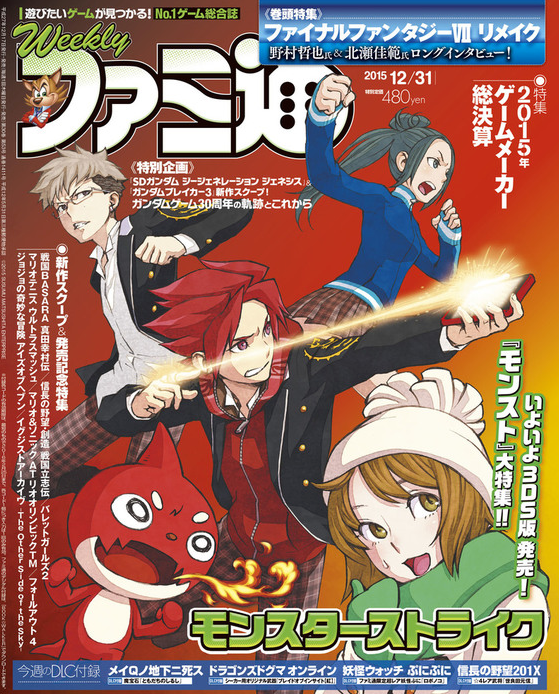 An illustration shows the full costume; it has awesome golden flames at the bottom, making Yukimura resemble a phoenix according to the article. The six coins of the rokumonsen are arranged in a cross on his back this time. He's fighting his rival Date Masamune in the main picture. Masamune is dressed in a slightly different outfit too, white with gold highlights. Masamune certainly seems to be a main character from his prominence in the article. His image colour is white in this game, a departure from what we're used to. The characters have flashy gold parts on their weapons too. An inset picture shows Yukimura surrounded by Tokugawa soldiers. Another shows that Masamune's white costume has a golden cross on the back, a clear reference to a story about the real Masamune and Hideyoshi which YamamotoD has mentioned a few times in the past. As mentioned in yesterday's leaks, the game will go as far as the famous Osaka Summer Siege. As part of the Sengoku Basara Retsuden Series the game's story focuses on an individual character (Yukimura) as one long dramatic story, full of blazing drama which runs closer to actual history. Osaka Castle is billed as the stage for the decisive battle, a natural decision given its role in the famous series of sieges Yukimura is still associated with today. The game's genre is 'action'. Details such as the price and CERO rating are still unconfirmed. Development is 50% complete. The voice actors for Yukimura and Masamune are still Hoshi Souichirou and Nakai Kazuya, of course. The game's interface isn't shown but it looks really similar to the usual style. New moves are confirmed for both characters. A comment from the magazine staff observes that Masamune always has all six blades drawn in the gameplay pictures so far. While KobaP and YamamotoD are still credited as series producer and series director respectively, the game's producer is Nonaka Daizou and Tanaka Toshihiro is credited as director. The article finishes with a two-page interview with Nonaka and KobaP. KobaP said that Yukimura is a very important character in the Sengoku Basara series and they felt as though he hasn't had many opportunities to take a central role as the main series developed. Since the 400th anniversaries of the Osaka Winter Siege and Summer Siege took place last year and this year, it made him want to try focusing on Yukimura from a new perspective. It's going to be a Sengoku Basara game with a single long story, a little like Devil May Cry or Biohazard (Resident Evil). The interviewer asked whether other characters would star in future games of this kind. KobaP refused to give any hints; there are plenty of things they want to do but he still doesn't know what will happen. Producer Nonaka has no previous involvement in the Sengoku Basara series but KobaP has been working with him for three or four years. Since this is a new series (the Retsuden Series, not Sengoku Basara itself!) he's letting a new producer and staff take care of the project. Nonaka spoke up too at this point. He said that even though he hasn't worked on the series before, he's always been interested in it and plays the games as a fan. So he was very pleased to be called upon. They removed the usual Sengoku Basara logo because it wouldn't make sense to have the Date crest in the background for a game about Yukimura. Actually, redesigning the logo gave them quite a lot of trouble. It was hard to get the balance right and incorporate the rokumonsen crest, so they settled on something easy to understand. KobaP explicitly confirmed that the game will be closer to actual history than the version of Yukimura's life story we've seen so far. Nonaka said he went back and researched Yukimura's life story all over again in order to work on the game and even if he left everything as it really happened historically, Yukimura's short life was dramatic enough as it was. He was already involved with many famous warriors and major events, so upon adding some 'Basara-style' flair the story steadily expanded. The interviewer thought that a lot of the fans would be wondering which other characters might appear. KobaP joked that he wasn't able to say anything about that but there is a very high possibility that characters with links to Yukimura - just like his rival, Date Masamune - will show up. They'll reveal additional characters gradually, along with brand new characters. This remark sent the interviewer into a panic so KobaP continued to explain. It wouldn't really be possible to tell Yukimura's life story properly if his family didn't appear, so his father Sanada Masayuki and older brother Sanada Nobuyuki will be in the game as new characters. Yukimura will have father-son and brotherly connections in the game as well as his usual rivalry with Masamune. Yukimura has never been shown interacting with Masayuki or Nobuyuki before so Nonaka wanted to show him having real human relationships. KobaP told everyone not to worry, Masamune and Yukimura themselves won't be portrayed too differently to usual. The costumes were redesigned to launch the Sengoku Basara Retsuden Series and give it a different feel to usual. KobaP said that even though the series is ten years old they've never altered the characters' base outfits before. He thinks that doing it right from the start this time will have a big impact. Yukimura's redesigned outfit is inspired by the Osaka Summer Siege, where the real Yukimura died. Nonaka said this was his peak as both a human being and warrior. He wanted an outfit worthy of such a climax so every single part of the new costume is flashy and they made it more like a jinbaori. Sadly Nonaka couldn't talk about much more without revealing spoilers, so he stopped at this point. The interviewer was surprised that talking about a jinbaori could be a spoiler. KobaP laughed and said "I wonder?" then changed the subject by mentioning that the game would include various other costumes in addition to the ones which have been revealed so far. (From Sengoku Basara Magazine issue 10) The anecdote about the time Masamune dressed in white is another great story. He arrived late for his duties at Odawara and when he went to apologise to Hideyoshi, he wore white burial clothes to the meeting. In addition, when he had to explain himself after causing an uprising, he shocked the people of the capital - including Hideyoshi - by arriving dressed in white once again and carrying a golden crucifix. KobaP also thinks that the white colour has a western-style knightly image to it. The redesign of Masamune's outfit to remove his traditional blue and famous helmet is rather striking. The interviewer said the characters' images had changed a lot. KobaP assured them that it isn't just costumes; their move sets have been redone as well. Fans will get a fresh feeling from both of them when they play the game. It's already been five years since Sengoku Basara 3 and both Yukimura and Masamune have had some upgrades in that time. However, it feels as though they're lagging behind compared to newer characters like Ashikaga Yoshiteru and Sen No Rikyuu in Sengoku Basara 4 Sumeragi. KobaP and YamamotoD thought it would be a bad idea to recklessly make changes to the characters's move sets. However, since this new game gave them an opportunity to try it out they went ahead and used the momentum from designing the brand new characters to revamp Yukimura and Masamune as well. The idea behind Yukimura's new moves is 'a Yukimura who has become stronger'. Nonaka reassured the readers that he plays similarly to before. They can't give any specific details about Masamune yet but it's a little different to Yukimura, who is the main character you control for most of the game. Masamune's role is somewhat antagonistic as Yukimura's rival, and his personality comes across more strongly this time. Masamune doesn't have his own separate story, it's more that you can control him at certain points in the game. The story shifts between different characters' viewpoints and at those points you control the other characters. As for stages, they're only focusing on Osaka Castle in this particular article. It's being introduced with an evening shot showcasing Hideyoshi's helmet shape over the castle keep, the way it was recently depicted in the main game series. KobaP joked that Hideyoshi doesn't even wear a helmet in Sengoku Basara. They all joked a little about how the castle keep doesn't really have any gameplay elements anyway. KobaP said it made you want to climb up to the top (not a serious comment). The stage gimmicks have been changed for this game, so players will have to adapt rather than using their previous strategies. They're aiming to release Sanada Yukimura Den next summer, so we can look forward to more reveals before then. I imagine the official website will be live very soon to share all of these images in decent quality. Edit: Here we go, the official website is now online. 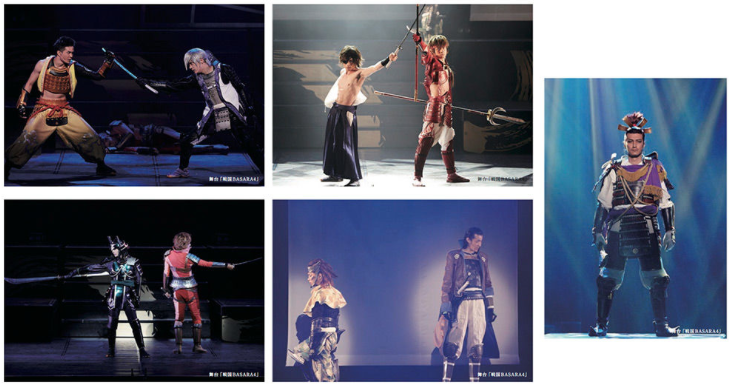 The DVD recording of Butai Sengoku Basara 4 is coming out after all! This is such good news that it deserves an exclamation mark. 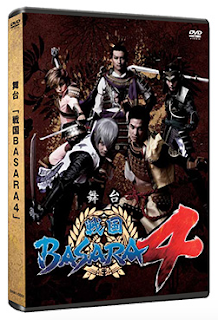 The DVD version of the 2014 stage play, Butai Sengoku Basara 4, has had its cancellation cancelled. Citing fan demand as the reason for its release, the announcement confirms that the DVD set will include two discs for a runtime of 183 minutes (the play itself) plus 118 minutes of bonus footage. The extras include 'making of' documentary, cast interviews, a compilation of moments from the 'after show' talks on stage, the curtain call from the grand finale and interviews with the actors who graduated from the Butai Sengoku Basara series at the end of the show. Buyers who order the first press edition will receive five cast photographs along with their DVDs. The set will cost ¥7,500 and it's already available for preorder through the Ace Shop. I expect it to receive a general release through normal retailers later on. No English subtitles are listed on the specification, which isn't too surprising as this play didn't have the 'live subtitling' feature of some more recent events. Gamer is reporting that a Capcom Shop will open in the Parco department store in Utsunomiya, Tochigi between 18th December 2015 and 11th January 2016. It's difficult to see buried under all of the Monster Hunter merchandise but there will be some Sengoku Basara goodies available to fans who make the trip to visit. I've been to that Parco a number of times and it's generally very quiet, so I hope that the shop does well over the holiday period. There will probably be a few nice New Year offers available. New BASARA game sounds awesome but I'm a little concerned about the its gameplay (no huge character roster to please everyone) and especially about the language barrier. And since I'm not that much of Yukimura's fan (despite the fact my cat was named after him) I don't really know if I'm happy about the series' direction. But, hey, I'm still happy for those who dig a young tiger, especially if they know their japanese alright. Will probably give it a shot anyway even if it's not exactly my cup of tea to be honest. Will be all ears about further updates on the title. That's a good point, it might be more text-heavy than usual if it's story-heavy. On the bright side, if it's more historically accurate then it will be easier to follow than some of the really weird storylines they've invented over the years! I prefer the less 'honourable' characters overall (I tried to think of a nice way to say that without making myself sound evil) but if there's one thing Yukimura is at all times, it's entertaining, so I think he'll be a fun lead. I hope this 'Retsuden Series' idea takes off, because focusing on smaller groups of characters between the main games means we might finally get some proper story focus from some of the warriors who traditionally don't get much time in the spotlight. I feel similarly; I have nothing against Yukimura (or Masamune) but he isn’t on my favourite list when it comes to the playable game characters. So I’m a bit hmm about this game so far, that it will just focus on those 2 characters, gameplay wise. It is also weird to see Masamune in all white and no helmet. Not only is the Ace Shop Japan-only but it doesn't even accept foreign credit cards, so it's a bit annoying. Even though I already ordered it I really hope they do a general release later. Maybe I'll send them an email. I think I will. I hope they answer you if you write to them. The official site has been published! Yukimura's new costume is so awesomely epic! *O* Masamune's one is interesting... It's going to take me a time to be used to see him without his famous helmet, but even so, it's great (I like the legs in particular, look like dragon skin). Yukimura is looking really good. The shape of Masamune's collar is strange after being used to his usual attire, but I like the impact of the shot of him from behind a lot so I think it will work. It sounds as though Masamune is going to have quite a good amount of exposure in this game too, possibly more than in 4 and Sumeragi if the plot is only focusing on a smaller number of characters. So I would guess that if we see future games in the series he might not be the next character they pick; I suppose it depends heavily on exactly what they cover in this one. I can't wait for more details. Yeah, I hope they take the opportunity for lots of new costumes to give the game a distinctive look of its own (not sure who the designer for the new game is yet but both Tsuchibayashi and Ookubo have come up with some excellent alternate outfits in the past). Since the platform is the same, and they likely use the same base character models, it would be fun if we can import our Sumeragi characters into this game and vice versa (via DLC or - ideally - a disc-swap feature of some kind), to allow us to take full advantage of both games.